Strawberries with Prosecco features local strawberries in such an elegant manner; truly summer entertaining at it’s best. Select a fine bottle of Prosecco, Il Colle being a family favorite, to compliment the strawberries. A fine bottle? There are quality differences, a subject for a later post hosted by Mio Marito. Lengths of lemon peel and mint awaken the natural flavor of the the fruit. Strawberries with Prosecco is a perfect example of a recipe that illustrates the simplicity of Italian food it all of it’s glory. Served outdoors after a late afternoon meal, it is an ideal way to end a summer evening. 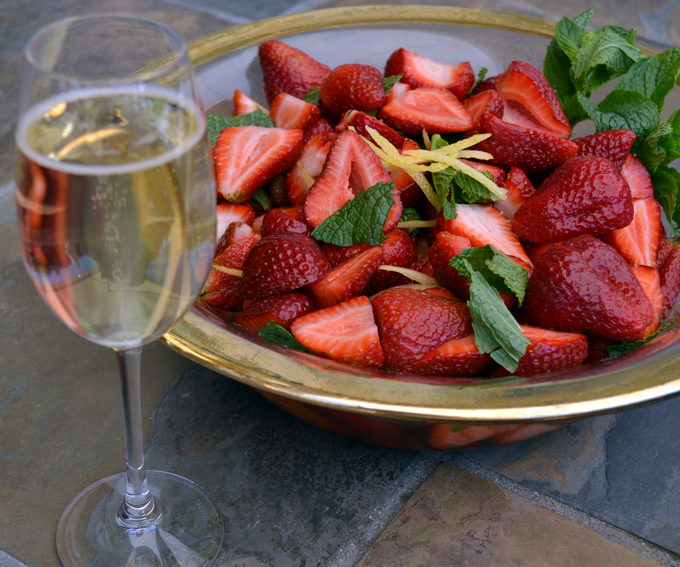 Strawberries with Prosecco is recipe adapted from the brilliant cookbook, Marcella Cucina by Marcella Hazan. Long considered the doyenne of Italian Cooking, Marcella is credited with introducing the American public to the finer points of traditional Italian cuisine. Her cookbooks, written in Italian then translated into English by her husband Victor, are indispensable guides to understanding the the products, techniques and culture surrounding food from an Italian prospective. Watsonville, just about one hour south of San Jose, produces some of the finest strawberries imaginable. How lucky can we be to have a farm stand just around the corner that trucks in a fresh supply of these seasonal beauties daily. Of course red juicy strawberries are just about everywhere in the Bay Area at this time of year, but our local farm stand has the tastiest berries ever. Enjoy the lazy days of summer and dazzle your guests by presenting Strawberries with Prosecco along with a few biscotti at your next gathering. If you enjoyed this post please subscribe and share with friends. Select a large bowl that will feature the finished dish nicely. Wash the strawberries under cold running water and allow them to drain well. If after draining the strawberries they still seem wet lay them on paper toweling to absorb the remaining water. Slice the stem off the strawberries, then slice each in half placing the strawberry halves into the bowl. Cover the berries with the lemon strips and sprinkle with the cup of granulated sugar. Gently pour the Prosecco over the strawberries, watching it fizz. Take a spatula and gently turn the berry mixture. Add the torn mint leaves and turn once more. Place the bowl of scented strawberries into the refrigerator for at least one hour to allow the flavors to merge. Serve cold garnished with a few mint sprigs. Best of all Marisa, it’s carefree…as summer should be. Can’t wait for local berries. Can you believe I have four open bottles of Prosecco in the fridge? Four, I’m impressed…We are a bit ahead of you in terms of season, but they are coming soon. Those are the most beautiful berries I’ve ever seen, and what an elegant dessert! I am fortunate to have a farm stand nearby which features local strawberries from April through early July. Thank you for such a lovely compliment, it’s all about the simplicity. I so appreciate your lovely and kind comments, La Bella Sorella is a labor of love form me. Thank you for following.